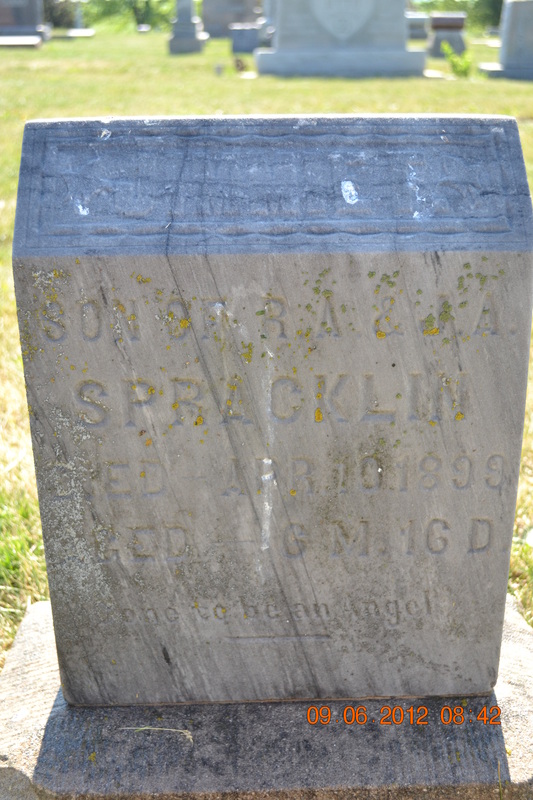 Lydia Marie Spracklin was born 12 July, 1864 in Benton Co., Iowa to Daniel and Sarah Spracklin. She died 27 May 1931 in Somers, Calhoun Co., Iowa. Lydia married Thomas Jefferson Ross on 9th September, 1881 in Dayton Twp., Iowa Co., Iowa. Daniel had to give his permission. Source: Marriage Record “D,” Iowa County, Iowa, Page 542 “D,” Iowa County Marriage Record. Lydia and Thomas Ross’ Marriage. Subscribed in my presence by D. Spracklin and by him sworn to before me this 9th day of September 1881, D.E. Evans Clerk Circuit Court. 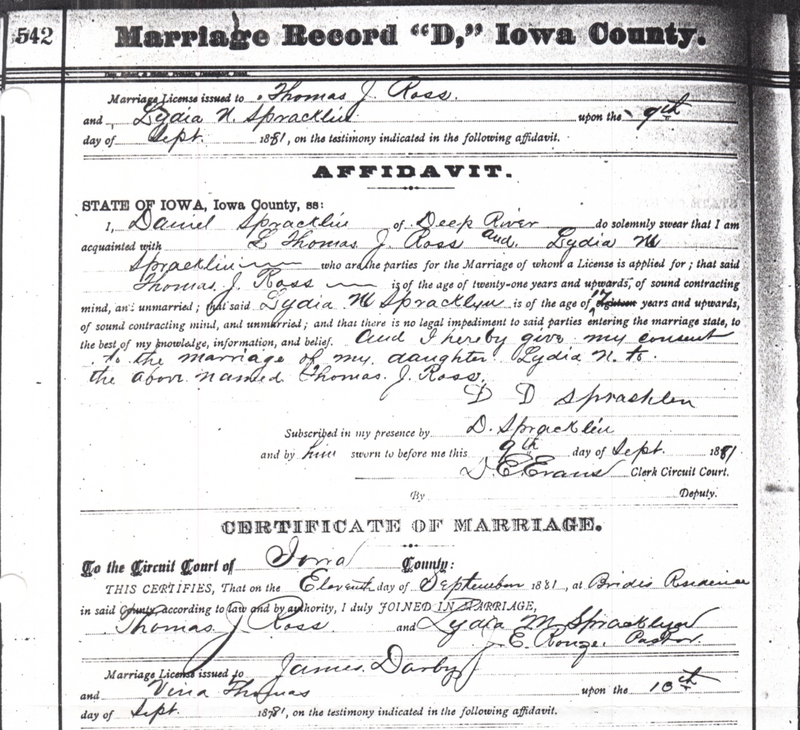 Certificate of Marriage, Iowa County, Eleventh day of September, 1881, at Bride’s home. Signed by Thomas and Lydia and E. Rouze, Pastor. Thomas Jefferson Ross was born 17 January, 1849 in Ohio and died 27 May, 1931 the same day as Lydia. They were both killed when a train ran into them. See article below for details about their deaths. Thomas was the son of Joseph Ross born 1814 in Pennsylvania. Joseph died 19 March, 1900. Thomas’ mother was Mary Jane Barr born 1836 in Ohio. She died 3 September 1898. I do not know how Mary Jane Barr fits into the Barr family or is related to Amarilla Keller Barr’s family? Joseph’s father was Robert Ross born 28 July, 1781 in Pennsylvania and died 22 February, 1843 in Tuscarawas Co., Ohio. The mother was Martha who was born 13 December, 1785 in Tuscarawas Co., Ohio and died 2 March 1843. I am not sure of the Tuscarawas County for her birth, the county was not established till 1808. Robert born 1847 in Ohio. William born 1859 in Iowa. George born 1859 in Iowa. Maybe William and George were twins? 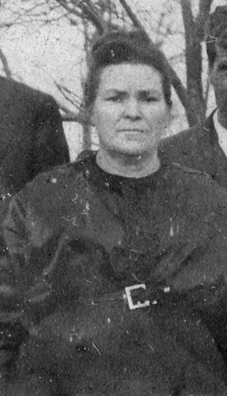 Amanda Elvira Jane born 1862 in Sigourney, Keokuk, Iowa. Amanda married a Joseph Blackwell on 24 July, 1880 in Sigourney, Keokuk Co., Iowa. They had the following children: Bertha Bell 1879 to 1952 m. George Walter Worth and had three children, Lillie May Josephine b. 1881, George D. born 1886 and Charlotte Melinda 1888-1978. Charles A. Ross b. 1871 in Iowa. Thomas was born January 17, 1849 in either Illinois or Ohio. He hired on with Daniel Dare Spracklin in 1873. According to Lydia’s granddaughter, Doris Moeller, Thomas married Lydia Marie Spracklin at her father’s residence on September 11, 1881, by Pastor E. Rouze. Sometime after their marriage the couple moved to Ft. Dodge, acquired some land along the Des Moines River. Then they moved back east for a time, possibly to either Ohio or Illinois. However, not wanting to lose the Iowa property, they returned to Iowa. They sold this original property on November 25, 1887, they purchased part of the property they lived on until their untimely deaths in 1930. For their first home, Thomas built what was probably a sod home, unfortunately their first winter proved to be a severe one. It is told that Thomas apparently hadn’t sealed or insulated the walls enough near the top on the north side of the house, so it didn’t keep the cold out. To keep their infant from freezing to death, Lydia had to keep the child bundled on her bed. She had also tried placing pieces of packing boxes in the cracks to help keep out the cold. However, come next Spring, Lydia insisted that the walls be what she called “Back Plastered” so that she and her family never had to be that cold again. Over the years, the couple added to their property and during their married life together they had nine children, two daughters died in infancy and were buried in the Cedar Cemetery, Calhoun Co., Iowa. 1885 Iowa State Census Lydia and Thomas are living in Calhoun Co., Iowa. Thos J. Ross, age 36, farmer, born in Ohio, Lydia M. Ross, age 20, keeping house, born in Iowa, Bertha L. Ross, born in Keokuk Co., Iowa, All living in Twp 88, Range 31, Section 36. 1895 Iowa State Census Lydia and Thomas are still living in Calhoun County and Lydia’s brother Reed is living with them. 1900 Lydia and Thomas Ross where continue living in Calhoun County, Iowa in Greenfield Twp. This township is on the east side in the slightly darker area of the atlas, one row down. 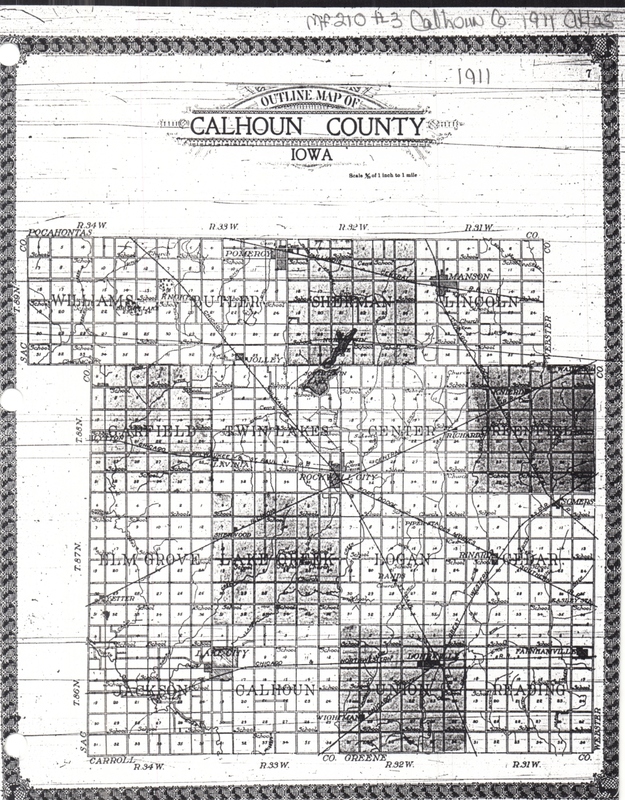 This first atlas page of the county of Calhoun has towns and cities which may help to identify where people were living. Greenfield Twp., Calhoun Co., Iowa. 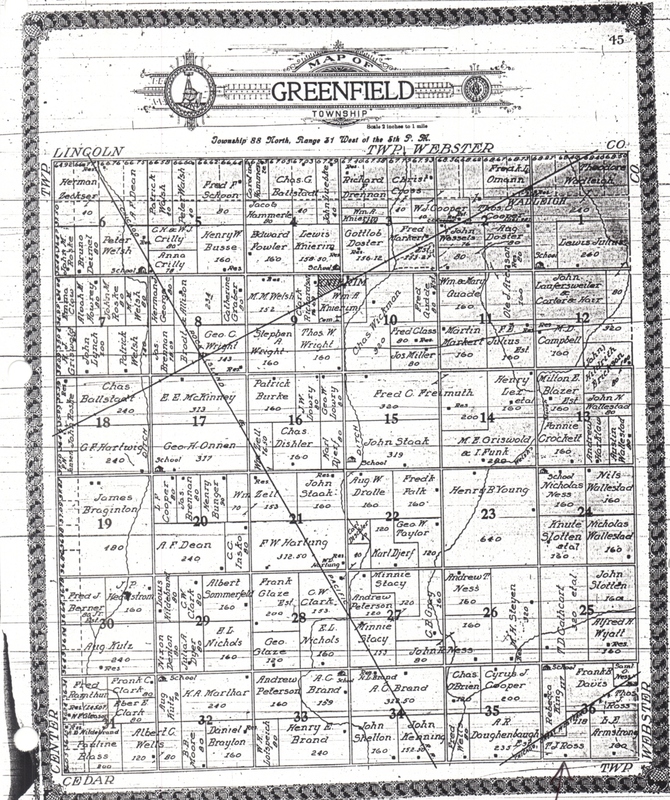 NOTE: Thomas’s land was in the lower right, southeast corner of Greenfield Twp. 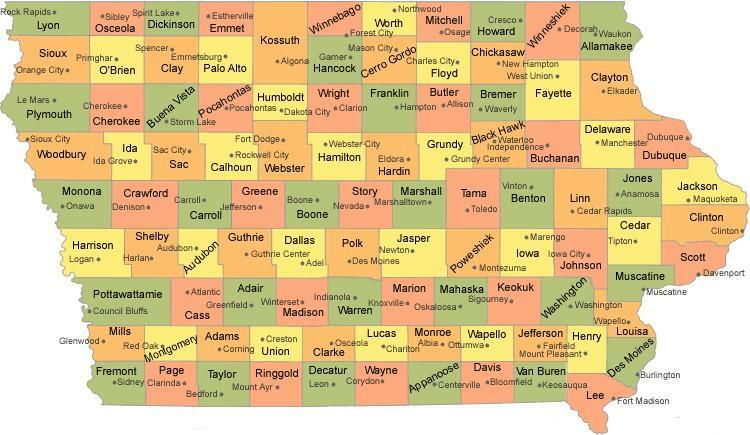 Source: 1900 U.S. Federal Census, Calhoun Co, Greenfield Twp., SD#10, ED #25, Sht #4. Line 1, 43, 44, Ross, Thomas J., Head, W, M, June 1849, 31, M, 19 yrs, born Ohio, father born PA, mother born Ohio, farmer, O, yes, yes, no, O, M, F, 15. 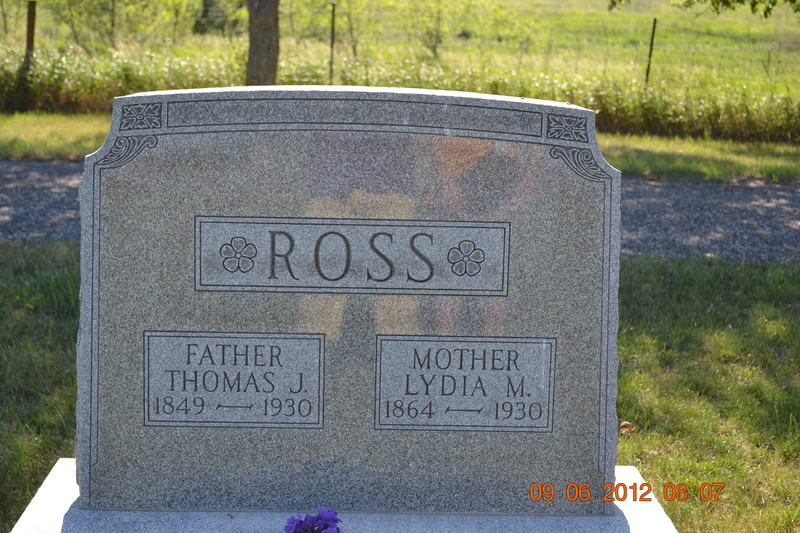 Ross, Lydia M, Wife, W, F, July 1864, 35, M, 19 yrs, 7 born, 5 living. born Iowa, father born Ohio, mother born Indiana, yes, yes, yes. 1910 the family was still in Greenfield Twp., Calhoun Co., Iowa. Source: 1910 U.S. Federal Census, Calhoun Co., Greenfield Twp., Iowa, SD#10, ED#30, Sht 8, enumerated 4th May 1910, by ______. Line 13, 128, 129, Ross, Thomas, Head, M, W, 61, M1, 29, born Ohio, father PA, mother Ohio, farmer, general farm. Things were changing and by 1920 and the family was getting smaller as the children grew up. Source: 1920 U.S. Federal Census, Calhoun Co., Greenfield Twp., Iowa, SD#10, ED#36, Sheet 6B, enumerated Feb. 7 and 9th, 1920, by Carl E. Djoif. Line 43, Fm, 133, 120, Ross, Thomas J., Head, O, M, M, W, 70, M, born Ohio, father PA, mother Ohio. 1925 Iowa State Census included the nativity of the person. Source: T.J. Ross Family, 1925 Iowa State Census, Greenfield Twp., Calhoun Co., Iowa Roll 53AA, lines 6-9, State Historical Society of Iowa, Iowa City, IA. T.J. Ross, Head, 76 years old, value of home $2,850.00, mortgage $1200, insured on home $2500. Lydia Ross, wife, 60 yrs. Ivan Ross, son, 31 yrs., single. Earl Ross, son, 19 yrs., single. All were born in Iowa. T. J.’s father was Joseph Ross born in PA, his mother was Millie Barr, born in Ohio. Lydia’s father was Dan Sprecklin born in Ohio, mother was Sarah Blacketer born in Indiana. Religion: None for all of them. In 1930 Iven is nearby his parents who are aging. Source: 1930 U.S. Federal Census, Calhoun Co., Iowa, Greenfield Twp., ED#13-16, SD#5, Sht #1A, enumerated on April 2, 1930, by Myra P. Black. Ross, Alice, Wife-h, X, F, W, 37, M, 36, No, Yes, born Iowa, father born Iowa, mother born Indiana. Line 3, 2, 2, Ross, Thomas J, Head, O, yes, M, W, 81, M, 33, No, Yes, Ohio, father born PA, mother Ohio. Ross, Lydia M, Wife-H, X, F, W, 65, M, 17, No. Yes, born Iowa, father born Ohio, mother born Indiana. Thomas and Lydia had nine children of which two died young. I have received the information about the family from various sources and each cousin has their own version of the members of Lydia and Thomas’ family. All of the information and research below, needs to be verified with more census, marriage, death and other records. 1. Bertha Lillie Ross was born 1 October, 1882 in Keokuk Co., Iowa and she died 21 November, 1964 at Fort Dodge, Iowa. She married on 10 November, 1904 to William A. Davis (Divis). She died September of 1964. William was born 28 January, 1880 in Fort Dodge and died there on 21 July, 1945. They appear in the 1920 U.S. Federal Census in Fort Dodge, Webster, Iowa under the name William A. Davis. Webster County is northwest of Des Moines. Source: William A. Davis Family, 1920 U.S. Federal Census, Iowa, Webster Co., Fort Dodge City, Precinct 1, SD#10, ED#238, Sht. #10, enumerated on the 24th of January 1920 by Mrs. Lora V. Buckles. Line 39, Avenue G, 239, 204, 219, Davis, William A., Head, O, M, M, W, 38, M, yes, yes, born Iowa, father born Iowa, mother born PA. Laborer, Oatmeal Mill, w. Davis, Lillie, wife, F, W, 37, M, yes, yes, born Iowa, father born Ohio, mother born Iowa. Davis, Herlin, son, M, W, 13, S, yes, yes, yes, born Iowa. Davis, Paulia, daughter, F, W, 12, S, yes, yes, yes. Davis, Kyle, son, M,W, 8, S, yes, born Iowa. Davis, Icel, son, M,W, 9/12 S, born Iowa. They are living in Wahkonsa Twp., Webster Co., Iowa in January 1925. Source: Wm. Davis Family, 1925 Iowa State Census, Line 30, 239, Davis, Wm. A. Head, M, W, 45, M, O, M, 2700, 1200, 1600, 45, 45. Davis, Lilian, Wife, F, W, 42, M. Davis, Herlin A, Son, M, W, 19, S. Davis, Paulia L., Daughter, F, W, 17, S. Davis, Kyle A, Son, MW, 13, S. Davis, Icel, R, Son, M, W, 5, S.
They are in Elkhorn Twp. in Webster Co., Iowa in 1930. Source: William Davis Family, 1930 U.S. Federal Census, Elkhorn Twp., Webster Co., Iowa, ED#94-12, SD#2, Sht #3A, enumerated April 14, 1930, by Mrs. Amelia G. Churchill. Line 15, 45, 45, Davis, William A. Head, R, yes, M, W, 48, M, 23, No, Yes, born Iowa, parents born Ohio, yes, Laborer, brickyard, W, yes, No. Davis, Lillian, Wife-H, O, F, W, 46, M, 22, No, yes, born Iowa, Father born Ohio, Mother born Iowa, yes, Manager, gen farm, _yes, VVVV, 45. Davis, Paulia, Daughter, F, W, 22, S, No, yes, born Iowa. Davis, Icel, Son, M, W, 10, S, Yes, Yes, born Iowa. They had the following children based on cousin research and the census, although the spelling of each name is not clear. 1. Harlan/Herlan A. Davis was born 28 February, 1906 at Fort Dodge, Webster, Iowa. 2. Paula L. Davis was born 12 October, 1907 in Somers, Calhoun Co., Iowa. 3. Kyle L. Davis was born 15 September, 1911. 4. Gale R. Davis was born 15 April, 1915. Note: I am not sure about this child. 5. Icel Ross Davis born 15 April, 1919, died 31 August, 2000. 2. Sarah Ross was born 27 July 1885 and died the same day in Calhoun Co., Iowa. Birth and cemetery records verify her life. She is buried in the Cedar Township Cemetery in Calhoun Co., Iowa. 3. Ray Virda Ross born 23 April 1888, in Cedar Twp., Calhoun Co., Iowa and died 23 December 1957. He married Barbara and they had Ralph Ross and Hazel Ross. I found Ray and Barbara in the 1930 U.S. Federal Census living in Richland, Dickinson Co., Iowa. Source: Ray Ross Family, 1930 U.S. Federal Census, Richland Twp., Dickinson, Iowa, ED#30-16, SD#1, Sht#2A, enumerated 5 April, 1930 by Elmina J. Liddle. Line 31, 30, 31 Ross, Ray, Head, O, R, Yes, M,W, 41, M, 28, No, Yes, born Iowa, father born Ohio, mother Iowa, farmer, gen. farming, VVVV, yes, no, 28. Ross, Barbara, wife, F, W, 31, M, 17, No, yes, born Iowa, father born Iowa, mother born Iowa. Ross, Hazel G. Daughter, F, W, 11, S, yes, yes, born Iowa. Ross, Ralph, Son, M,W, 10, S, Yes, yes, born Iowa. Johnson, Russel, nephew, M,W, 24, S, No, yes, born North Dakota, parents born Iowa. Laborer, farm, V1VV, W, Yes, No. 4. Mae Ermmavilla Ross was born 6 June, 1890 in Greenfield Twp., Calhoun Co., Iowa. She died 3 September, 1971 in Gilmore City, Humboldt Co., Iowa. Mae married Robert Judson McVay on 10 December, 1913 in Fort Dodge, Webster Co., Iowa. Robert McVay was born 23 February, 1890 in Farnhamville, Calhoun Co., Iowa and died 12 November, 1937 in Los Angeles, California. He is supposedly buried in the Reading Township Cemetery in Calhoun Co., Iowa. Robert is the son of George Washington McVay and Mary Louise Smith. Robert and Mae appear in the 1920 U.S. Census in Union, Calhoun Co. Iowa. Source: Robert McVey family, Lohrville Town, Union Twp., Calhoun, Iowa, SD#10, ED#46, Sht, 5B, enumerated on 28 January, 1920 by C. V. Hulse. Line 88, Elm Street, 129, 130, McVay, Robert J. Head, R, M, W, 29, M, yes, yes, all born in Iowa, parents born Iowa, Garage, town SM. McVay, May E. wife, F, W., 29, M, yes, yes, father born Illinois, mother Iowa. McVay, Max Ray, son, M, W. 1 7/12, S, born Iowa. Hall, Robert, roomer, M, W., 26, S, born Iowa, helper, elevator, W.
On May 19, 1922 they divorced. Date of Divorce – May 19, 1922, Iowa. Robert McVay born about 1913. Max Rae McVay was born 14 June, 1918 in Lohrville, Calhoun Co., Iowa, and baptized 12 August, 1932 in Gilmore City, Humbolt Co., Iowa. He died 11 January, 1996 in Los Angeles, California. He married June Anglia Hacket on 7 August, 1943 in Fairborn, Green Co., Ohio. She was born 1 June, 1922 in Cedarville and died 12 September, 1971 in San Bernadino, California. They had several children. Max was a member of Mayflower till his death in 1996. A copy of his application is in the possession of the writer. Some of the information for the McVay family came from the application. Max also corresponded with Bertha Roufley in the 1980’s about the family history, that is how I recognized who he was. Mayflower General Number #050245, State No. 4559. Max went into Mayflower on the Goss lineage. I obtained a copy of his application when I visited the Mayflower Society in Plymouth, MA back in 2003. Iona Pearl McVay born 20 March, 1920 in Lohrville. She married a Ernest J. Lindquist on 1 September, 1950 in Gilmore City, Iowa. Mae remarried to a Ralph McLean Roberts on 25 January, 1924 in Gilmore City, Humboldt Co., Iowa. Ralph was born 13 November, 1894 in Gilmore City. Ralph was married before and had two children: Melvin Ralph Roberts (1916-1934) and Clarence Thornton Roberts (1918-1943 buried at sea). Ralph McLean Roberts is the son of William Harris Roberts and Eva Jane Spalding. Source: Authenticated Record of Marriage, Roberts-McVay, January 25, 1924, Gilmore City, Humboldt Co., Iowa I Betty L. Vonderaar Smith am not the clerk of the District Court in Iowa she signs the form at the bottom. Full Groom Ralph W. Roberts, Gilmore City, Iowa, Farmer, 30 years, born Gilmore City, Father W. H. Roberts mother Eva J. Spalding, second marriage. Bride: May E. McVay, main name May E. Ross, resides Gilmore City, Iowa, 34 years, born Somers, father T.J. Ross, mother Lydia Spracklin, second marriage. Married Jan. 25, 1924 in Gilmore City, Iowa, Witness Mrs. A.J. Esperson, Lyman Beers, Certified by A. J. Esperson, Pastor, First Baptist Church, 11, day of October, 1982. Source: 1940 U.S. Census, Weaver Twp., Humboldt, Iowa, SD#8, ED#46-27, Sht #21, enumerated on April 9, 1940 by Mae J. McLaughlin. Line 19, 23, R, Roberts, Ralph M, Head, O, M, W, 46, M, No, H1, 9, Iowa 65, Same house, yes, yes, 1, 70, Farm Operator, farming, OA, 3, 52, No, 20. Roberts, Mae E, wife, 1, F, W, 49, M, No, H1, 9, Iowa, 65, no, no, no, no, H, 5, O, O, No. McVay, Iona, daughter, 2, F, W, 20, S, No, 1, 40, Iowa 65, yes, 1, 40, Stenographer, Life Ins. Co, PW, 24, 250, No. Hatting, John, laborer, X, M, W, 21, S, No, H2 10, Iowa, 65, R, Palo, Alto, Iowa, yes, 1, 70, laborer, farm, Pw, 52, 20, no. 5. Iven Thomas Ross was born 21 January, 1892 in Calhoun Co., Iowa and he died 20 February, 1981 in Cedar Twp., Calhoun Co., Iowa. Iven married Alice Mae Allbec on 7 September, 1929 in Iowa Falls, Hardin Co., Iowa. They had two daughters Doris and Carol. Alice was born 24 January, 1892 in Muscatine, Iowa and died 15 November, 1962 in Cedar Twp., Calhoun Co., Iowa. Source: Iven Ross Family, 1930 U.S. Census, Greenfield Twp., Calhoun Co., Iowa, ED#13-16, SD#5, Sht#1A, enumerated on April 2, 1930 by Myra P. Black. Line 1, 1, 1, Ross, Iven, Head, R, R, yes, M, W, 37, M, 36, No, Yes, born Iowa, father born in Ohio, mother in Iowa. Farmer, general farm, VVVV, yes, No. 1. Ross, Alice, Wife-H, X, F, W, 37, M, 36, No, Yes, born Iowa, father born Iowa, mother Indiana. Alice and Iven are still in Calhoun Co., Iowa in 1940. It appears that he may have taken over his parent’s farm. Source: Iven Ross Family, Greenfield, Calhoun Co., Iowa, SD#8, ED#13-16, Sht# 6B, enumerated April 1940, by Vigor Larson. 6. Deanie Ellen Ross was born 27 July, 1895 and died 7 March, 1897 in Calhoun Co., Iowa. She is buried in the Cedar Township Cemetery in Calhoun County per birth and burial records. 7. Grace Irene Ross was born 24 August 1896 in Cedar Twp.. She married a Walter R. Parker on 19 December, 1914 in Estherville, Emmett, Iowa (Iowa Select Marriages Index). Walter’s parents were William Parker and Frances F. Smith. She may have married a second time. Source: Walter Parker Family, 1920 U.S. Federal Census, Lake, Calhoun Co., Iowa, SD#10, ED#37, Ward 3, Sht#8B, enumerated 7 January 1920 by Mattie Sibley. Line 85, 221, 226, Parker, Walter, Head, R, M, W, 36, M, yes, yes, born Illinois, father born Indiana, mother born Illinois, propt, restaurant, OA. Parker, Grace, wife, F, W, 23, M, yes, yes, born Iowa, father born Ohio, mother born Iowa. 8. Elsie Pearl Ross was born 10 July, 1902 in Greenfield Twp., Calhoun Co., Iowa. She married a man named Booth and had several children. She is said to have married another time to an Earl Powell who died about 1982. Elsie Pearl Ross, daughter of Lydia and Thomas Ross. 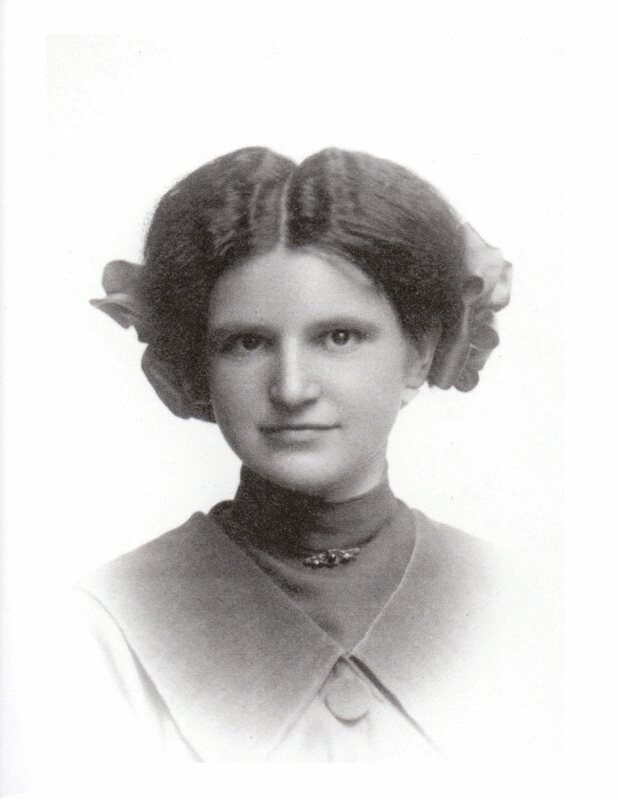 There is an Elcie Booth age 17 born in Iowa living with the family of William Booth in Lake, Calhoun Co., Iowa. She is listed as a daughter-in-law and above her is an Ezra Booth age 23, both are married. The mother of Ezra is Sarah. I think this might be Elsie but more research needs to be done to verify it. Elsie is living in Twin Lakes, Calhoun Co., Iowa and is a housekeeper for a private family. She is divorced. Source: Elsie Booth, 1930 U.S. Federal Census, Twin Lakes, Calhoun Co., Iowa, ED#13-28, SD#5, Sht #6A, enumerated April 14, 1930 by Mary Laird. Line 30, 1, 1, Powell, Earl, head, R, R, yes, M, W, 29, S, No, yes, born Iowa, father born Canada, mother born US. yes, Farmer, general farm, VVVV, O, yes, No, 81. Booth, Elsie, housekeeper, F, W, 27, Div., No, No, born Iowa, housekeeper, private family, 6V96, W, yes. Booth, Pearl, M, daughter, F, W, 9, S, Yes, Iowa. Booth, Darlene, daughter, F, W, 7, yes, Iowa. 9. Earl Edward D. M. Ross was born 27 January 1906 in Cedar Twp., and died 11 January 1996 in Lake City, Calhoun Co., Iowa. He married to Pearl Mary Swettenham in 1932. She was born 4 July, 1889 in St. Louis, Missouri and she died 18 May, 1974 in Santa Anna, Orange Co., California. She was the daughter of William T. Swettenham and Francie Clayson. He may have married a second time to a Louella M. Mills who died 26 April, 1981 in Santa Anna, California. Earl appears with a Pearl in the 1940 Census in California. Source: Earl Ross Family, 1940 U.S. Federal Census, Twp. 3, Kern Co., California, SD#10, ED#15-47, Sht#14B, enumerated April 16, 1940, by Andrew Boue. Line 77, 2715, 314, 0, 2500, No, Ross, Earl, Head, M, W, 39, M, No, O, born Iowa, Riverside, Calif., yes, Salesman, Retail Appliances, Pw, 298, 68, 1, 52, 1500, No. Ross, Pearl, wife, F, W, 51, M, No, 5, 5, born Mo., No, No, No., H, 0, 0, No. 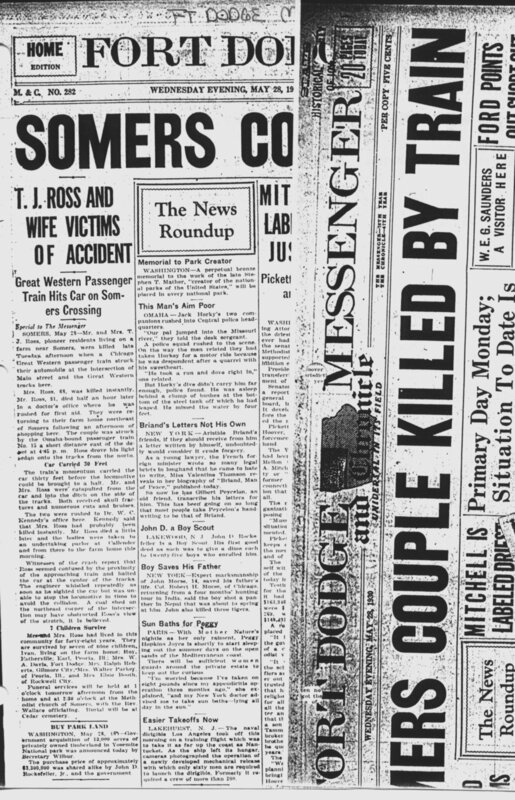 Somers – May 28 – Mr. and Mrs. T. J. Ross, pioneer residents living on a farm near Somers, were killed late Tuesday afternoon when a Chicago Great Western passenger train struck their automobile at the intersection of Main street and the Great Western Tracks here. Mrs. Ross, 65, was killed instantly. Mr. Ross, 51, died half an hour later in a doctor’s office where he was rushed for first aid. They were returning to their farm home northeast of Somers following an afternoon of shopping here. The couple was struck by the Omaha bound passenger train, No. 13 a short distance east of the depot at 4:45 p.m. Ross drove his light sedan onto the tracks from the north. Car carried 30 feet – The train’s momentum carried the car thirty feet before the locomotive could be brought to a halt. Mr. and Mrs. Ross were catapulted from the car and into the ditch on the side of the tracks. Both received skull fractures and numerous cuts and bruises. The two were rushed to Dr. W. C. Kennedy’s office here. Kennedy said that Mrs. Ross had probably been killed instantly. Mr. Ross died a little later and the bodies were taken to an undertaking parlor at Calendar and from there to the farm home this morning. Witnesses of the crash report that Ross seemed confused by the proximity of the approaching train and halted the car at the center of the tracks. The engineer whistled repeatedly as soon as he sighted the car but was unable to stop the locomotive in time to avoid the collision. A coal shed on the northeast corner of the intersection may have obstructed Ross’s view of the stretch, it is believed. Source: Wednesday Evening, May 28, 1930, Ft. Dodge, Messinger & Chronicle, film dated May 1, 1930 to June 30, 1930, State Historical Society of Iowa, Iowa City, IA. Source: Death Certificate for Lydia Ross, Calhoun Co., Greenfield Twp., Iowa, Mrs. Lydia M. Ross, Female, White, married, Husband Thomas Jefferson Ross, age 65 yrs, 10 mos. 15 days, housewife. Father Daniel Spracklin, mother Sarah Blacketer, Ivan Ross is the informant. Burial in Cedar Twp. Cemetery. Died May 27, 1931, comma, hit by train no. 15 on the Great northern, accidental, head injury. There are memorials at Find A Grave for Thomas and Lydia Ross but no tombstone photos. Update 10/16/2015: Here is a photograph of the Ross tombstone, done my a cousin and kindly shared with me. I was digging around in my records and realized I had this so I add it to this post. See photo below for a son of Reed and Julia. Lydia and Thomas Ross, photos courtesy of P. Stoudt. The Calhoun Co., Iowa Cemeteries, book has a listing on pg. 3 not just for Lydia and Thomas but also for several of her brothers Virda and Reed’s children: Cedar Twp. Cemetery, published by the Iowa Genealogical Society, Des Moines, Iowa. This cemetery is located a 1/2 mile east of the town of Rinard. Deanie E. dau of T.J. & L.M., Died Mar 7, 1897 l yr, 11 mo, 19 da. Row 13, Spracklin, Joelle E. Died Mar. 7, 1890 2 yr 9 mo 11 days a daughter of Virda Spracklin. Spracklin, Daniel G. 1870-1927. This is Daniel Goss Spracklin, Lydia, Reed and Virda’s brother. Willie son of R. & J. 1901-1902. Again there is much more research to do on this family of Lydia and Thomas Ross. I would not mind studying their land purchases and probate file. Obituaries, cemetery research, deeds, probates, vital records and much more need to be collected to get a clearer picture of this large family. I did a great deal of the research on this family back in 2003 when I visited Iowa going to the State Archives and Iowa Genealogical Society. So it has been awhile since I have visited the research on this family. I did not visit the western part of Iowa confining my trip to Iowa City, Marengo, and Des Moines. I was in search of Daniel D. Spracklin’s life at that time and trying to connect him to his ancestors. This entry was posted in Allbec surname, Benton County, Bertha Lillie Ross and William A. Davis Family, Calhoun County, California, Cedar Township Cemetery, Daniel and Sarah's Family, Daniel Goss Spracklin and Susan Morrow Lash, Davis surname, Dayton Township, Dickinson County, Earl E. D. M. Ross and Pearl M. Swettenham, Elsie P. Ross and E. Booth and E. Powell, Estherville Emmett County, Fort Dodge, Grace I. Ross and Walter R. Parker Family, Greenfield Twp., Indiana, Iowa, Iowa County, Iven T. Ross and Alice M. Allbec Family, Keokuk County, Lydia M. Spracklin and Thomas Jefferson Ross Family, Mae E. Ross and Robert J. McVay Family, Mae McVay and Ralph M. Roberts Family, Mayflower Heritage, McVay surname, Parker surname, Ray V. Ross and Barbara Family, Reed A. Spracklin and Julia Ann Siler, Research Trip to Iowa 2003, Roberts surname, Ross surname, Sarah Ross and Deanie Ellen Ross, Swettenham surname, Updates and corrections, Virda H. Spracklin & Lilly May Amsden, Webster County and tagged Descendants of Daniel D. Spracklin and Sarah, Iowa cemetery records, Iowa Genealogical Research, Spracklin brothers and sisters. Bookmark the permalink.